BenRiach was founded, like so many more Scottish distilleries, in the late 19th century. Unfortunately, it too closed shortly after and was mothballed for a significant amount of years. Fortunately, it's floor maltings continued to be used by a neighbouring distillery and probably saved the distillery from demolition. It was reopened in 1965 by Glenlivet Distillers, who were later acquired by Seagrams, who themselves were acquired by Pernod Ricard. The following year the distillery was mothballed again. The next significant chapter in BenRiach was the acquisition of the distillery by an independent consortium, led by Billy Walker, who were at the helm for 12 years, before Brown-Forman took over. 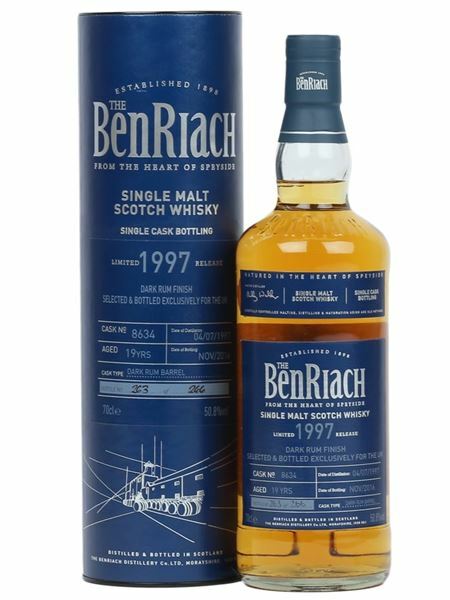 This BenRiach bottling, one of 266, contains whisky laid down in 1997, 4 years after Seagrams first released under the BenRiach distillery brand. Ex-sherry and ex-bourbon barrels were used in the maturation before finishing in a dark rum cask. It was bottled in 2016 at 50.8% ABV.